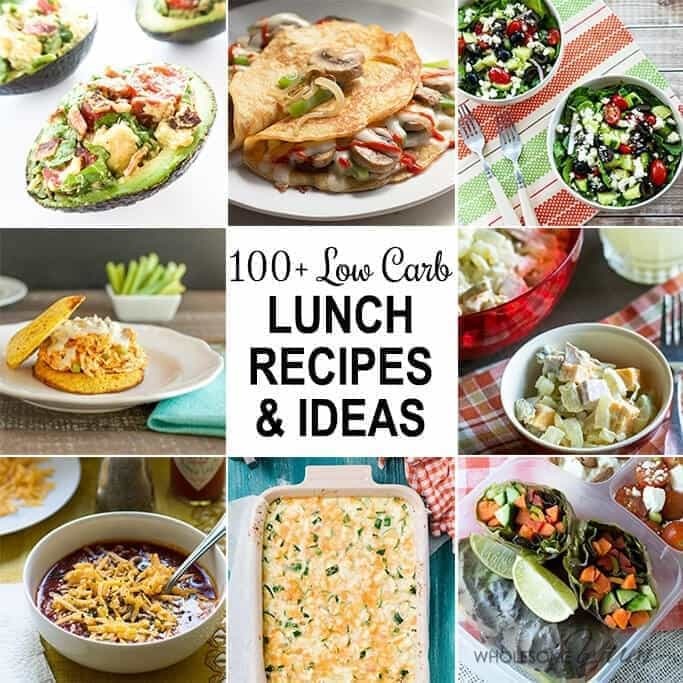 This huge collection of 100+ gluten-free, low carb lunch recipes has all the ideas you could want for easy low carb lunches. If there’s one meal that can be a struggle on a low carb diet, it’s identifying easy low carb lunches. It’s much simpler to figure out a quick grab-and-go breakfast or a dinner you have at least some time to prepare. Low carb lunch ideas are harder. Often times, people are at work, out and about, or just in a hurry without time to cook. You can usually find low carb options by heading out to eat, but that can get expensive! Since I bring my lunch to work on weekdays, often times it consists of leftovers. That’s fine for some days, but it can also get boring eating the same thing you had the night before, or the night before that. For this reason, I actually have a running list of low carb lunch ideas beyond leftovers. To balance things out, the solution is planning ahead. I make a meal plan every week anyway, so I include my low carb lunches in there too. Even if you don’t do weekly meal planning like I do, thinking about lunch in advance can be a huge time saver. There are two main ways to make low carb lunch recipes practical – choose ones that are super fast to make, or prepare them ahead of time. I like to mix it up and do some of both. 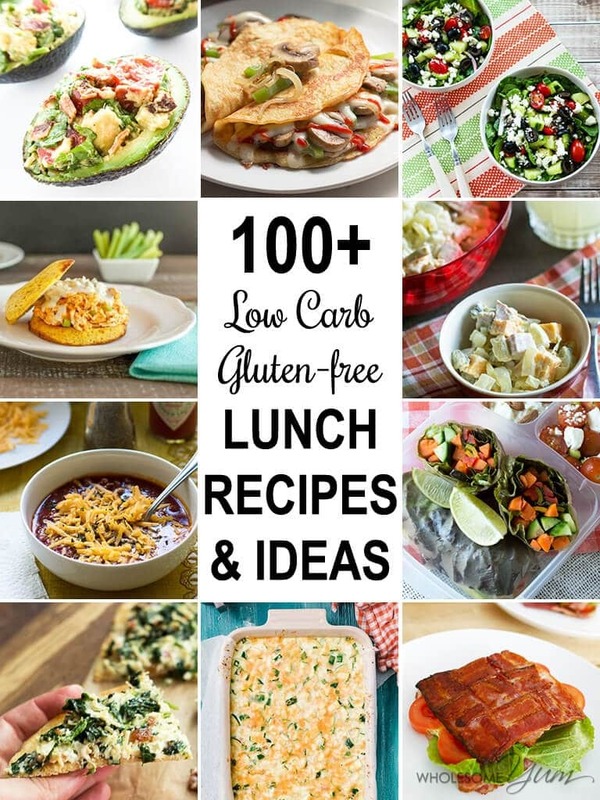 I’ve gathered this enormous list of over 100 gluten-free and low carb lunch ideas and recipes, giving you plenty of options for both kinds. 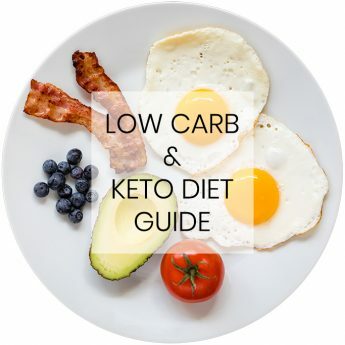 From soups to salads to low carb wraps, and everything in between, this keto lunch ideas collection will keep you covered for a while. 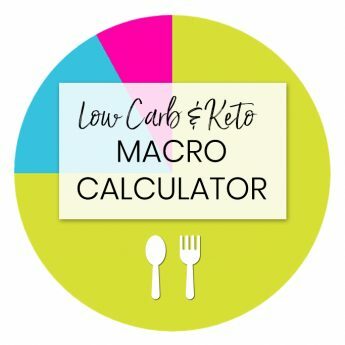 Ham And Cheese Macaroni Salad from Low Carb Yum – A low carb macaroni salad using shiratake noodles. Spinach and Kale Salad with Greek Flavors and Feta-Lemon Vinaigrette from Kalyn’s Kitchen – If you like Greek flavors, you’re going to love this spinach and kale salad with Greek flavors and feta-lemon vinaigrette. Chicken Fajita Nachos from Joy Filled Eats – Flavorful nachos that swap out tortilla chips for sweet peppers. Zucchini and Bacon Slice from Ditch the Carbs – A super easy recipe for a low carb zucchini and bacon slice. Easy Crockpot No Bean Chili from Drop The Sugar – An easy to make low carb no bean chili perfect to make for a couple of quick lunches. Philly Cheese Steak Wraps from Low Carb Maven – Try your favorite filling in a super low carb wrap. They are quick, easy and portable. Indian Butternut Squash Soup from Step Away From The Carbs – This butternut squash soup is rich with Indian flavors such as garam masala, turmeric and cumin. Buffalo Ranch Chicken Salad Sandwiches from Beauty and the Foodie – A delicious flavor combination of buffalo chicken and ranch served on a grain free, low carb sandwich bun. Healthy Deviled Eggs from Veggie Balance – Deviled eggs are made even better with avocado and horseradish. Add a side salad and you’ve got lunch. 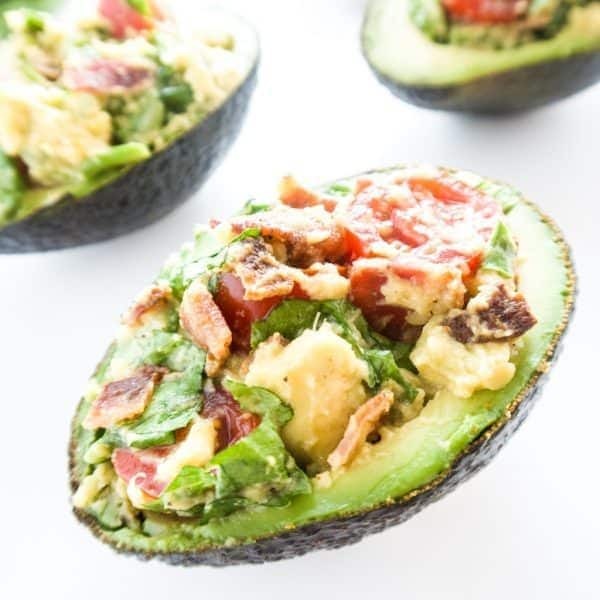 BLT Stuffed Avocado from Wholesome Yum – Stuffed avocado makes a quick and easy low carb lunch. Even better when it has the flavors of a BLT. Chicken Cobb Salad For One from Low Carb Yum – The perfect low carb salad when you need lunch for just yourself. 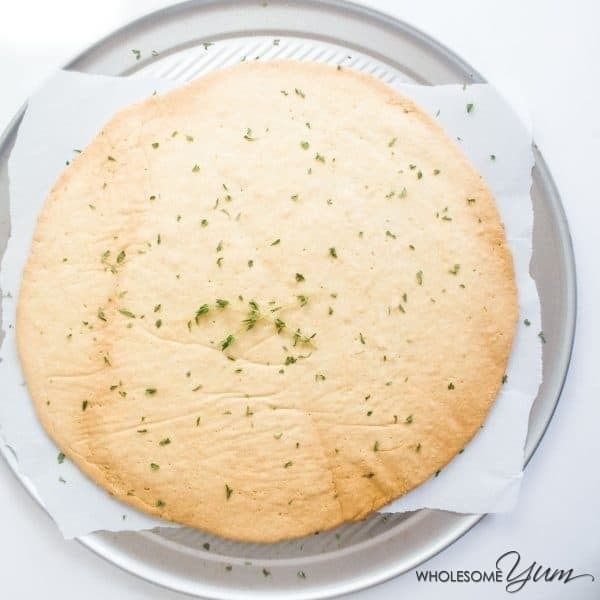 Focaccia Bread from Ditch the Carbs – An incredibly versatile low carb focaccia bread, just waiting to be made into your favorite sandwich. Egg Roll In A Bowl from Whole New Mom – All the goodness of egg rolls without the wrapper. Buffalo Chicken Salad Stuffed Avocado from Sugar Free Mom – You can never have too many stuffed avocado recipes, and who doesn’t love buffalo chicken? Strawberry, Spinach, And Avocado Salad from Low-Carb, So Simple – A delicious strawberry, spinach and avocado salad sprinkled with balsamic vinegar. Lasagna Rolls from Keto Adapted – Lasagna rolls that swap out regular noodles for turkey or chicken (protein noodles). Red Pepper Pesto with Squash Noodles from Creative Green Living – When you start craving something saucy to twirl with your fork, try this spaghetti squash with red pepper pesto. Easy Cheeseburger Salad from My Montana Kitchen – All the flavors of a juicy cheeseburger in a light and lovely salad. Bacon Chicken Caesar Pizza from Joy Filled Eats – If you’re in the mood for pizza, try this one topped with bacon and chicken. Garlic & Herb Parmesan Chicken Wings from Low Carb Maven – Super easy and tasty parmesan chicken wings are so crispy, you won’t believe it. 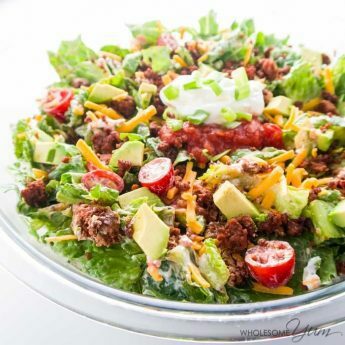 Healthy Taco Salad from Wholesome Yum – An explosion of Mexican flavors in a bowl. This salad makes a healthy and satisfying low carb lunch. Caesar Salad from Ditch the Carbs – A quick, healthy, and balanced caesar salad. Ham Cheese Veggie Muffin from Moore Or Less Cooking – Ham, cheese, veggies and egg beautifully whipped up to be a low carb, guilt free muffin. Smoked Salmon and Veggie Frittata from Allergy Free Alaska – The protein packed eggs in this frittata will keep you full the rest of the day. Grilled Romaine Hearts Tomatoes & Shrimp With A Basil Vinaigrette from Serena Bakes Simply From Scratch – A delicious shrimp and romaine salad with the flavors of basil and tomatoes. Cheesy Cauliflower Soup from Live Laugh And Craft – A comforting, warm soup with lots of cheese and cauliflower. Weight Watchers Zero Point Soup from Slap Dash Mom – A low carb cabbage soup that can fit into almost any diet. Buffalo Shrimp Salad from An Exercise In Frugality – A low carb salad topped with shrimp doused in buffalo sauce with bleu cheese dressing. 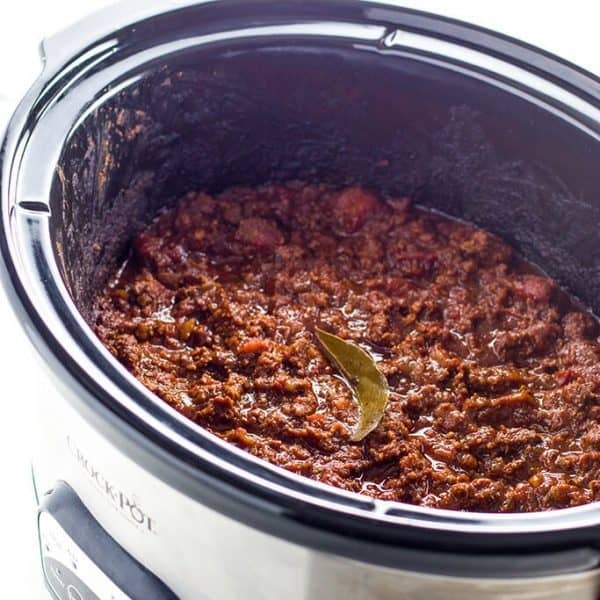 Low Carb Chili in a Crock Pot or Instant Pot from Wholesome Yum – Make this low carb chili in advance using your Crock Pot or Instant Pot. It stores well in both the fridge and freezer. More Egg-Citing Egg Drop Soup from The Organic Kitchen – This soup takes only 5 minutes to make and can be eaten for any meal of the day. Maple Sausage and Cream Cheese Jalapeno Poppers from Cherry & Spice – Jalapeño peppers stuffed and baked with maple sausage, cream cheese, sharp cheddar, and crispy bacon. Turkey, Avocado, and Hummus Roll Ups from Organize Yourself Skinny – Super easy turkey roll ups with only three ingredients. Classic French Ratatouille from Bacon Is Magic – It’s time to eat your veggies and there’s no better way than this classic French ratatouille recipe. Courgetti Aglio E Olio With King Prawns from Emma Eats & Explores – Zucchini noodles pair perfectly with garlic, chili, and jumbo shrimp. Summertime Vegetable-Shrimp Stuffed Avocados from the Heritage Cook – Rich avocado stuffed with shrimp and sauteed veggies. Easy Crispy Quesadilla from My Montana Kitchen – A crispy, crunchy chicken and cheese quesadilla that is full of flavor. Garlic & Dill Baked Flounder in Browned Butter from Raia’s Recipes – This simple dish is flaky and super easy to make. Wild-caught, cold-water fish are full of nutrition. Eggplant Salad from Lotsa Little Lambs – Perfect for a warm, hearty low carb lunch. 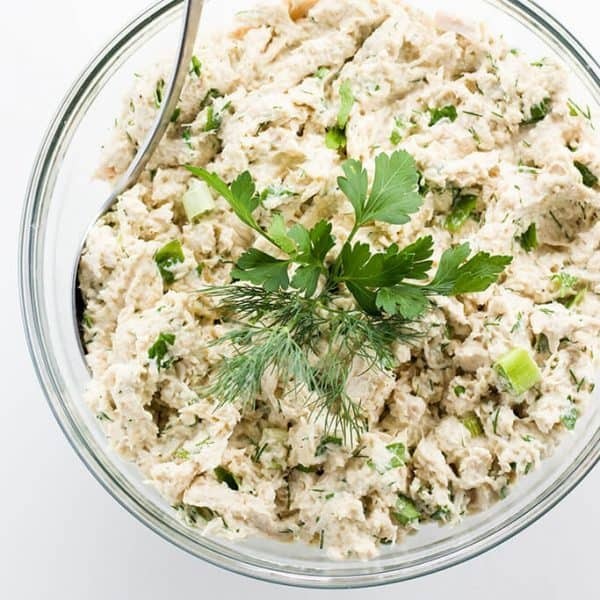 Easy Chicken Salad with Herbs from Wholesome Yum – Chicken salad is a great staple to have on hand. Eat it plain or wrap in a low carb tortilla. Seared Tuna Salad with Wasabi-Orange Vinaigrette from My Fling With Food – This salad is packed with flavor – like sushi in a bowl. Bacon Cauliflower Soup from Joy Filled Eats – Dairy-free soup flavored with bacon is perfect for a delicious meal that will warm you up. Bacon Buffalo Chicken Casserole from Wonderfully Made and Dearly Loved – All the flavors of buffalo chicken wings in a low carb casserole. 5-Ingredient Buffalo Chicken Salad from Briana Thomas – A creamy buffalo chicken flavored salad that would be perfect on top of low carb crackers. Tuna Thai Red Curry from Strength and Sunshine – If you’re a fan of red curry, try this one with tuna and lots of veggies. Cranberry Walnut Chicken Salad With No Mayonnaise from Low Carb Yum – A delicious chicken salad with cranberries, walnuts, and no mayo. Focaccia Flax Bread from Whole New Mom – Try this nut-free, gluten-free, and low carb bread for your sandwich. Creamy Mushroom And Cauliflower Risotto from Yummy Inspirations – This cauliflower risotto recipe tastes like the real thing but is low carb ketogenic diet friendly. Vegetable Spring Rolls from Sugar Free Mom – These veggie spring rolls with a lightened up peanut sauce are ideal for a lunch box packed in advance. 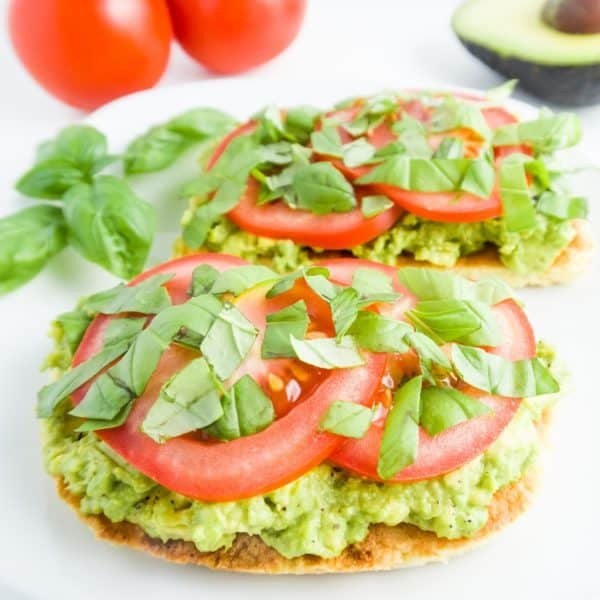 Tomato Basil Avocado Toast from Wholesome Yum – There’s no reason to miss avocado toast! With this recipe it can be low carb and paleo, too. Tex Mex Kale Casserole from Wonderfully Made and Dearly Loved – A delicious Tex Mex inspired casserole perfect for any day of the week. Chicken Bacon Ranch Power Salad from My Fling With Food – This easy, light, filling, and delicious salad definitely fits the bill for a power lunch. Tuna Melt Stuffed Tomatoes from Beauty and the Foodie – A low carb tuna melt without the bun and the carbs. Chicken Tostadas from Step Away From The Carbs – These low carb chicken tostadas are a wonderfully light Mexican-inspired lunch dish. Egg Salad from Briana Thomas – Egg salad is always a great option for a quick lunch, try it wrapped in a low carb tortilla. Black Radish Slaw from Delicious Obsessions – Black radishes are high in vitamin C, the B vitamins, and sulfur. The perfect addition to your lunch. Creamy Chicken & Mushroom Soup from Allergy Free Alaska – A rich and nourishing soup packed with chicken, veggies, and mushrooms. Easy Baked Fish With Lemon Butter Sauce from Raia’s Recipes – Delicious baked fish with a lemony buttery sauce. 4-Ingredient Pizza Crust from Wholesome Yum – Make this paleo pizza crust in advance, then add your favorite toppings for lunch. Bison Meatballs with Homemade Tzatziki from The Fit Blog – These delicious Bison Meatballs with Homemade Tzatziki are packed with Mediterranean flavors and perfect to take on the go. Balsamic Roasted Broccoli Salad With Garlic from Savory Tooth – A delectable roasted broccoli salad with carrots, parmesan cheese, balsamic vinegar, and plenty of garlic that’s perfect as a meal or veggie side dish. Buttery Tomato-Caper Chicken And Cauliflower from Mom Foodie – A delicious and healthy chicken recipe service served over cauliflower rice. Ratatouille & Meatballs from Allergy Girl Eats – Delicious meatballs add extra protein to all the baked veggies in ratatouille. Pizza Muffin in a Mug from My Montana Kitchen – All the savory flavors of pizza in a 2-minute microwaveable muffin. Avocado Chicken Salad Lettuce Wraps from Domesticate Me – A new take on lettuce wraps with lots of avocado. 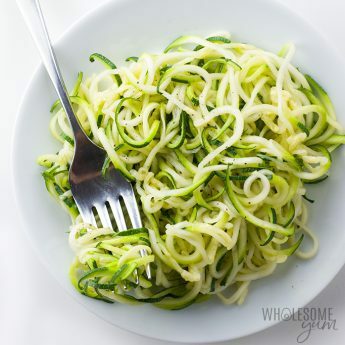 Improvised Zucchini Con Aglio et Olio from Christina Najjar – A delicious pasta dish – without the pasta. Creamy Spinach Soup from Lotsa Little Lambs – With Indian Spices, this quick, fragrant, warm and creamy soup makes a great lunch. Coconut Curry Chicken Meatballs from The Bewitchin Kitchen – These chicken meatballs are the perfect match for the coconut curry sauce they go with. 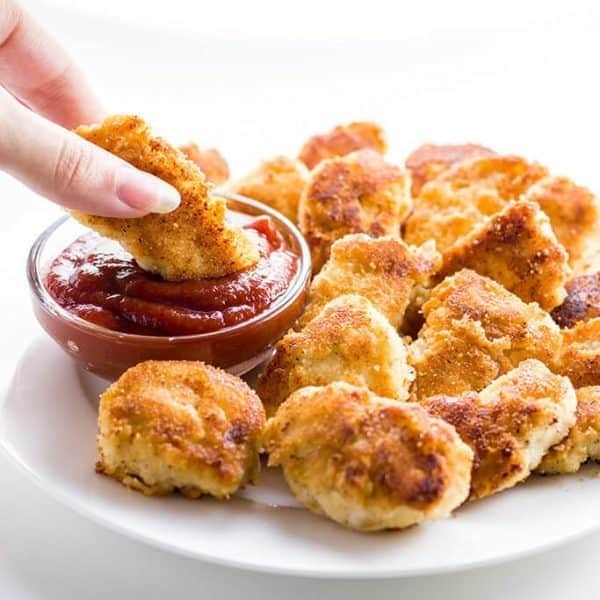 5-Ingredient Chicken Nuggets from Wholesome Yum – These chicken nuggets are quick enough to make even for lunch! You can also make them ahead and just reheat. Italian Tuna Salad from Mom Foodie – Italian Tuna Salad loaded with fresh vegetables, garlic, parsley and olives, is not only delicious and nutritious it is also makes a nice light diet-friendly meal. Bacon And Scallion Chicken Salad from New South Charm – A great on the go chicken salad that would be perfect in a lettuce wrap. Light Shrimp Curry With Spinach Over Cauliflower Rice from Grandbaby Cakes – Shrimp curry is always delicious served over cauliflower rice. Stuffed Instant Pot Chicken Breast from Pressure Cook Recipes – Easy make ahead umami stuffed instant pot chicken breast with only 7 simple ingredients. Peruvian Chicken Wraps from The Fit Blog – These chicken wraps can be made in 5 minutes and are perfect for busy days. Golden Bell Pepper Soup from Domesticate Me – This soup combines the magic of bell peppers and sweet potatoes to create an unbelievably creamy (yet cream-less) soup that’s equal parts bright and sweet. Roasted Garlic Hassle-Back Pork Loin from Jar O Honey – A roasted pork loin with the delicious flavors of garlic and prosciutto. Meatballs from Moore Or Less Cooking – Hot and mild sausages mixed with cheese to form a low carb meatball. 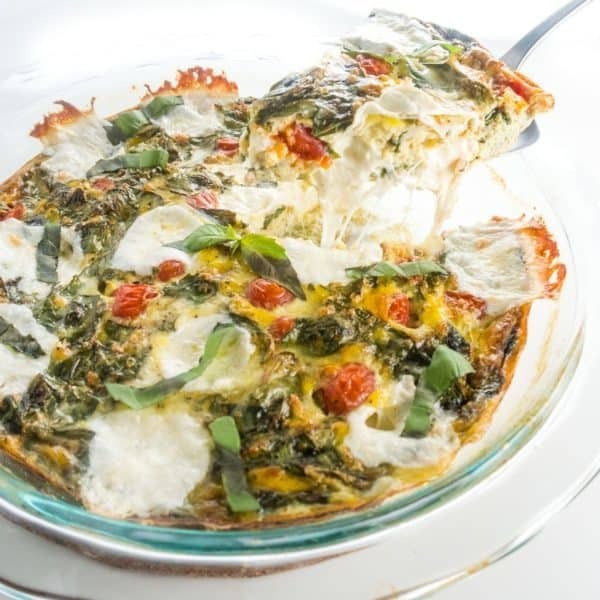 Crustless Quiche Caprese from Wholesome Yum – All the flavors of a Caprese salad, in cheesy quiche form. Make it ahead for an effortless low carb lunch. 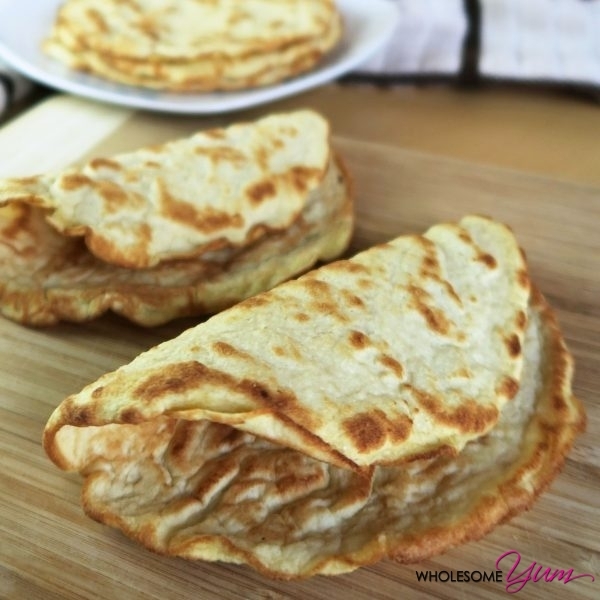 Savory Crepes and Keto Wraps from Forest And Fauna – These savory crepes are made with watermelon seeds and the perfect wrap to add to your lunch. One Pan Cauliflower Mac And Cheese For One from Yummy Inspirations – Can’t go wrong with a low carb take on the classic mac and cheese. Sweet Sriracha Easy Chicken Stir Fry from The Bewitchin Kitchen – An easy stir fry recipe with spicy sriracha. Cobb Salad from Low Carb Maven – One look at this loaded Cobb Salad and no one would think that you were losing weight. Salads make the perfect lunch for home or the office. Cold Thai Noodle And Vegetable Salad from Delicious Obsessions – Crispy vegetables paired with thin, crunchy kelp noodles, topped with a nutty lime dressing for an Asian flair. Chicken Soup For The Paleo Soul from Hollywood Homestead – A great simple recipe for paleo chicken soup to include a hefty dose of bone broth in your diet. Jalapeno Turkey Burgers from The Organic Kitchen – Delicious turkey burgers with a spicy kick of jalapeno. Garlicky Cauliflower Medallions from Almost Bananas – Use frozen cauliflower to whip up these garlicky cauliflower medallions. Super Fast Chicken Tortilla Soup from A Real Food Journey – Enjoy your favorite Mexican soup with none of the gluten or grains. Tuna Stuffed Avocados from Creative Green Living – You can’t beat the creamy avocado and protein packed tuna in this dish. 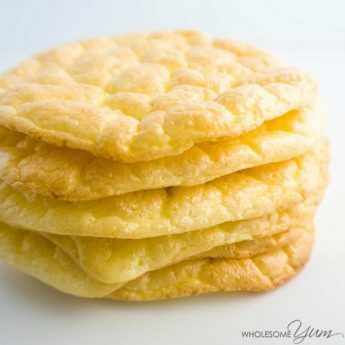 3-Ingredient Coconut Flour Tortillas from Wholesome Yum – Use these versatile paleo tortillas for your favorite fillings. Now your low carb lunch can include a wrap, too. Classic French Ratatouille from Bacon Is Magic – Can’t go wrong with a classic ratatouille recipe for lunch. Asian Lettuce Wraps from Fearless Dining – An Asian twist on lettuce wraps! Skip the honey in the marinade for a sugar-free version. Chicken and Avocado Salad with Lime and Cilantro from Kalyn’s Kitchen – This low-carb and keto chicken and avocado salad with cilantro and lime is perfect for a lunch that will keep you full all day. Magic Meat Muffins from The Nourished Caveman – Meat muffins make a perfectly portable and filling meal. “Fathead” Pizza Dippers from An Exercise In Frugality – Fathead pizza dough wrapped around mozzarella and dipped in a sugar-free marinara sauce. Homemade Unwich from Ketogasm – It takes just a few minutes to put together an unwich just like Jimmy John’s. Keto Mexican Rice from Keto Diet App – Cauliflower rice full of Mexican flavor makes a great vegetarian, low carb lunch option. One-pan Broccoli Cashew Chicken from Recipes to Nourish – Who needs takeout when you can make this in 15 minutes? Tabbouleh Zucchini Rice from Forest And Fauna – This version of tabbouleh uses zucchini rice instead of the grains. The No Bread BLT from Step Away From The Carbs – This popular sandwich has been given a makeover and now can be made without bread. 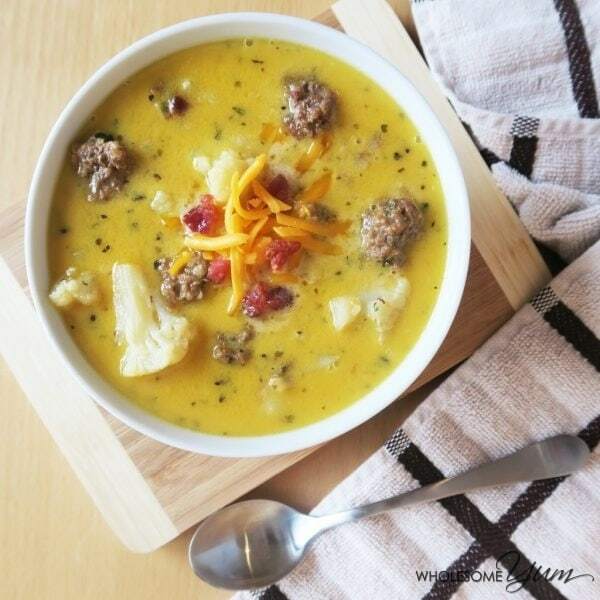 Bacon Cheeseburger Soup from Wholesome Yum – Bacon cheeseburger soup is pure comfort in a bowl. Ready in just 20 minutes. For more like this, check out these other gluten-free lunch ideas – with plenty of low carb options. OMG. I’ve died and gone to low carb heaven 🙂 I’m always looking for new recipes to try. Thank you for these. So many good ideas here; thanks for including me. 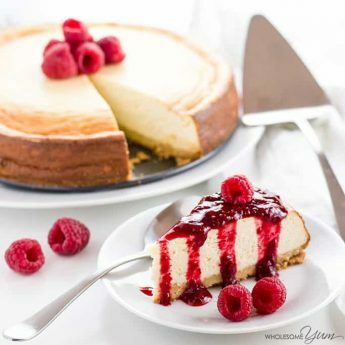 What an amazing collection recipes – this is so handy!